As decisions go, it had a sound foundation, but faulty results. Fred Couples’ reasoning for not having his wife travel with him to THE PLAYERS Championship 1984? It had to do with numbers, specifically 79-80 and 81-84. “We both knew I’d miss the cut,” said Couples, who had done just that, and badly, thanks to those scores the first two trips to THE PLAYERS Stadium Course at TPC Sawgrass. Ah, but what is it they say about the third time being a charm? It was for Couples, whose syrupy swing authored trips of 71-64-71-71 for 11-under 277 and for the second straight year a 24-year-old earned the game’s richest prize against the best field in golf. Not that older stalwarts didn’t offer a challenge, because 44-year-old Lee Trevino shook off an opening 76 with rounds of 66-68-68 to finish second, just one back, and both Seve Ballesteros and Craig Stadler finished at 6-under to tie for third. Throw in Tom Watson, who was three back going into Sunday and paired with Couples and Ballesteros, and a clearer picture developed of THE PLAYERS settled in nicely at the Stadium Course. “A good course like this with a good field like this brings the best players to the top,” explained Stadler. Against a backdrop of prestige and deep talent, Couples established scoring records with his second-round 64 and 277 total. Even better was the confidence gained by owning the 36-hole lead at 9-under. Couples had done more than make cut. He was giving fans a chance to witness history. 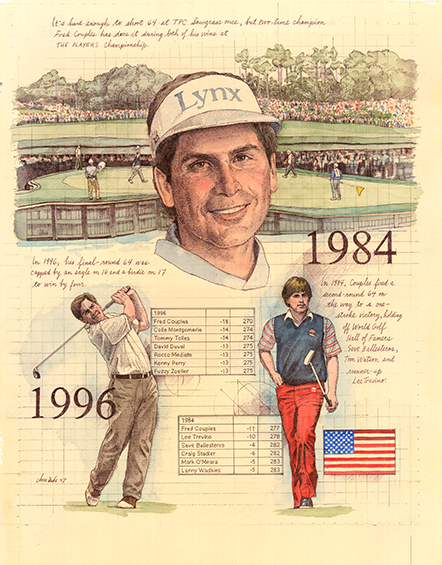 Tournaments are not won on the second day of play, but in 1984, Fred Couples went a long way to disprove that theory by shooting a second-round course-record 64 on his way to a one-shot victory over Lee Trevino. In what would transpire to be one of the greatest careers in golfing history, Couples, given the nickname “Boom Boom” because of his ability to drive the ball long distances, this victory in THE PLAYERS Championship 1984 was his biggest to date.